Welcome, mamas, and congrats on your pregnancy! Whether this is your first baby (how exciting! ), or you’ve done this before (still exciting! ), you have a big task ahead of you: get ready for your new baby. One big job is to set up the nursery and get all the gear you need to make caring for your baby as safe and easy as possible. It can be overwhelming, which is why we’ve compiled this baby product buying guide. 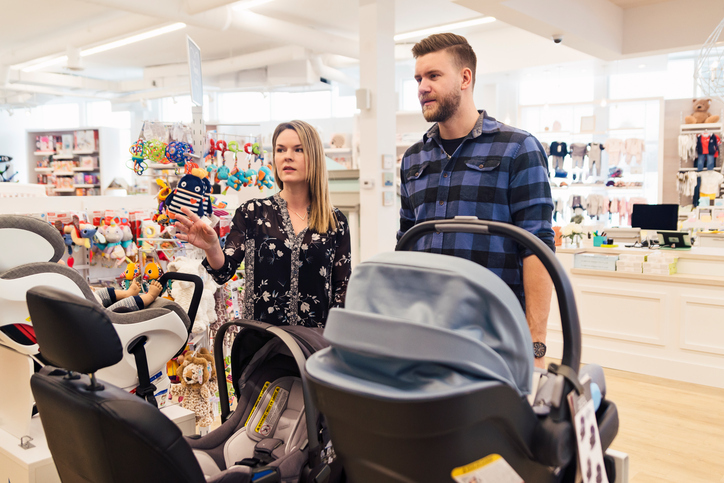 Featuring the top-rated items in each category, our baby product buying guide aims to make it easy for you to find the best for your baby. You might begin by looking for the perfect crib to suit your taste and space. You’ll need a crib mattress too. Keep an eye, ear, and more on baby with a choice of baby monitors. If you’re planning on nursing your baby, there are a few breastfeeding products you’re going to want (trust us!). Changing diapers is a truth of having a baby, and a nice changing table can make this chore a little more pleasant. And for those times when no amount of wipes will do the trick, you’re going to want a safe, slippery-newborn-friendly baby bathtub. A few baby travel items make getting out of the house fun and possible. You’re going to need an infant car seat (the hospital might even require it before you’re discharged). There’s a reason you always see parents with babies out for walks: they want to show off their super-functional strollers. Though baby carriers also have a place in many a new parent’s life. But don’t even think of leaving home without a stylish diaper bag packed with dipes, wipes, and an extra outfit, or that will be the trip when your baby has the world’s biggest blowout (this is guaranteed!). Your baby will look to you for soothing and entertainment, but there are times when you’ll need (and want) to outsource this. When that time comes, these swings and bouncers are lifesavers. And if you’re a planner, you’d do well to take a look at these potty training products -- you might be a couple of years away from needing these items, but why not get ready now! You’ll find it all here in this baby product buying guide.